Seychelles, 10 rupees, 1974. Collector coin. The obverse showed Queen Elizabeth II. Seychelles, 10 rupees, 1976. INDEPENDENCE. The obverse showed President Mancham. Seychelles, 10 rupees, 1977. SEA RESOURCE MANAGEMENT - a FAO slogan. The obverse showed the coat of arms. Seychelles, 5 cents, 1981. Cassava plant. World Food Day. There are many coins that have incorporated a FAO legend with their standard designs, but those are just a few. See also: Wildlife of the Seychelles. Tanzania issued its first 5 shilingi coin in 1971. It commemorated the 10th anniversary of independence. The reverse of the coin carried a FAO-themed design. The coin was then issued as a standard circulation issue from 1972 to 1980, without the special legend. RAIS WA KWANZA translates as "FIRST PRESIDENT". Below you see the standard coat of arms on the reverse of the collector Fiji $1 of 1969, and the reverse of the collector $10 of 1977, issued to commemorate the Silver Jubilee of Queen Elizabeth II. The obverse of both coins showed the Machin effigy of the Queen. Fiji, $10, 1995. Silver Jubilee of Independence. The obverse was the usual Machin effigy of Queen Elizabeth II. Jersey issued three commemorative predecimal pennies. It altered the legend to commemorate the occasion. 1] This version was issued in 1949 to commemorate the liberation of the island from the Nazis. One minor point here; this liberation reverse was used again in 1954 - QEII reign. Yes, still saying LIBERATED 1945 - but the year of issue (1954) was not included anywhere. True. You waited an exact month to respond to that post. (Depending on your country / time zone). Mainly because I came inside as its too hot in the 33 degree sunshine. 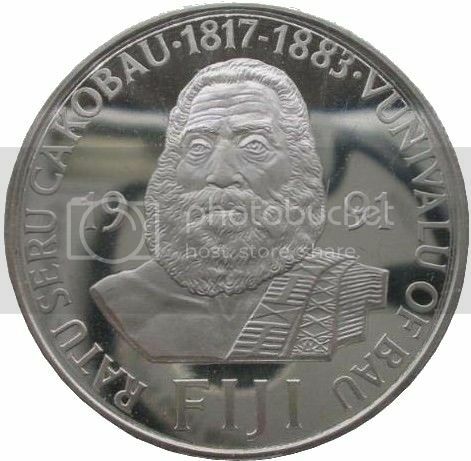 In 1974, Fiji issued two collector coins to commemorate the 100th anniversary of the cession of "The United Kingdom of Fiji" to Britain. They portrayed the King of Fiji, Seru Epenisa Cakobau. One was a silver $25 coin and the other a gold $100 coin. In 1975, Fiji issued another two collector coins, $25 and $100, with the same portrait of the King. This time the legend simply carried his name and birth and death years (1817 and 1883) and did not apparently commemorate anything. Fiji issued two special coins in 1991 in support of the "Save The Children Fund": a silver $10 and a gold $200 coin. Both showed a portrait of the old Fijian king by Dutch coin designer, Willem Vis. The coinage of the Irish Free State was first issued in 1928. On the obverse were the words "Saorstát Éireann", which is Irish for "Irish Free State", of course. Free of what? Free of Britain, I suppose. From 1939, the obverse was changed to read simply "Éire": the Irish word for "Ireland". I think "free" is used as "independent". Historically, this is what is meant by "free city" in e.g. Germany (freie Hansestadt Hamburg, freie Stadt Franffurt). It is a limited independence, as those cities were still within the German empire (but not in a German state). The only restriction on Irish sovereignty I can think of at the time of Irish independence is the Pope. It would be interesting to find out if this was the reason why Ireland chose to be known as a "free state".